Join us as we look at how we can better connect with God, each other & those around us. This a great opportunity to get to know other ladies at Apex Xenia. Julia Boyd, Jenny Weller and others will teach from the book of Ephesians. Please join us for as much time as you can. 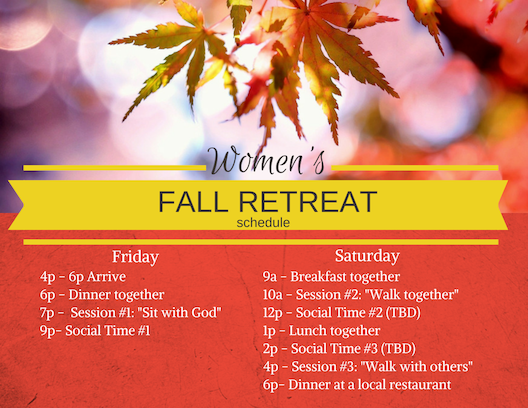 We will meet for sessions in a cabin and are reserving 4 in total at this point so people can spend the night too. You can join us for 1 day, both days, and even spend the night if you’d like to. RSVP by 10/14 using the button below. COST: There are 3 different rates. NONE of these rates include the meal out on Saturday, we would love to have you join us for the dinner and each person will cover their own meal. WHAT TO BRING: Bible, notebook, pen, warm clothes, toiletries, camp chair. You will be contacted about food after RSVP.